TEHRAN, November 20 - The pro-business Free Democratic Party abruptly announced its exit from three-way talks to form the German government on Sunday, citing a lack of common ground. The setback may see Germany hold new elections, challenging Merkel’s all but secured chancellorship. TEHRAN, Young Journalists Club (YJC) -The pro-business Free Democratic Party abruptly announced its exit from three-way talks to form the German government on Sunday, citing a lack of common ground. The setback may see Germany hold new elections, challenging Merkel’s all but secured chancellorship. The chances for a so-called “Jamaica coalition” of Angela Merkel’s Christian Democrats (CDU/CSU), the Free Democratic Party (FDP) and the Greens have worsened after the FDP slammed the door on exploratory talks late Sunday, with its chairman, Christian Lindner, saying that the party would rather not be in the government than agree with the terms of the proposed coalition accord. "Today there was no progress but rather there were setbacks, while the achieved compromises were questioned,” Lindner said, following marathon 12-hour talks. He went on to say that while FDP did not blame anyone for sticking to their principles, it is not going to betray its own. Explaining the motives behind the decision, the FDP pointed to the lack of rapprochement from other parties on issues key to the FDP, such as tax cuts, curbing red tape and education policy, according to the party’s negotiator, Joachim Stamp. “Making concessions only to the Greens is unacceptable for us,” he said, as cited by Epoch Times. The FDP’s threatened withdrawal was met with anger from the both the Greens and the CDU/CSU. “He chose populist agitation instead of political responsibility,” Greens party member Reinhard Butikofer wrote on Twitter. He claimed that the FDP had prepared the statement even before Lindner walked out of the talks. "[The FDP] carries out this ego trip on the backs of the voters who rightly expected the elected democratic parties to explore coalition options," Simone Peter, the Greens chairperson, told Tagesspiegel. “A well-prepared spontaneous decision,” Julia Klockner, CDU deputy chair, wrote, adding that while the CDU respects the FDP’s choice, it would be better if all parties involved made this announcement on the collapse of the talks together. German Chancellor Angela Merkel said she regrets the FDP’s decision, praising the deal that “would have guaranteed the stability of the country” and promising “to do utmost to keep the country safe and secure trough this period.” Merkel said she would notify the German federal president of the failure to form a coalition on Monday. The Social Democrats (SPD), meanwhile, announced that they would not review their decision to stay in opposition to Merkel’s government. “The SPD election tactic (“keeping it up,” that is staying in a “grand coalition”) was wrong on 24.9 [the election day] and it remains wrong as of 20.11,” Ralf Stegner, SPD deputy party chairman, wrote on Twitter. With the SPD refusing to relaunch a “grand coalition,” Merkel has several options to explore before snap elections will have to take place. If the FDP refuses to renegotiate, the CDU/CSU and the Greens will have only 44 percent of mandates, meaning Merkel has to be elected by the German Parliament if she wants to cobbled together a government majority. German President Frank-Walter Steinmeier may dissolve the parliament in case it elects the chancellor not with an absolute majority, but with a plurality of the vote, and then call for snap elections. 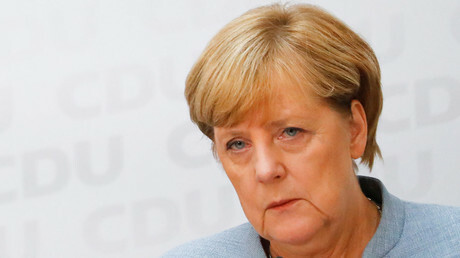 Although Merkel’s CDU/CSU alliance finished first in the September elections with 33 percent of the votes, it was its worst result in the post-World War II period as well for its closest rival, SPD, which gained just 20.5 percent of the vote. A breakthrough was made by the anti-immigrant AfD, which for the first time in its history entered the parliament with 12.6 percent of the vote.